See you later, alligator! After a while, crocodile! That was one of my favorite things to say as a child. Peyton and I say it to each other all the time. Sally Hopgood has taken one of my favorite sayings and turned it into a children’s book, geared towards children 3-6 years old. Emma Levey created colorful and engaging pictures to go along with the story. The story takes place in a park full of animals. That morning, Tortoise decides he wants to head out into the world and have an adventure, but before he can leave he must say goodbye to all his friends. He starts out, with his little pack and walking stick, walking through the park. 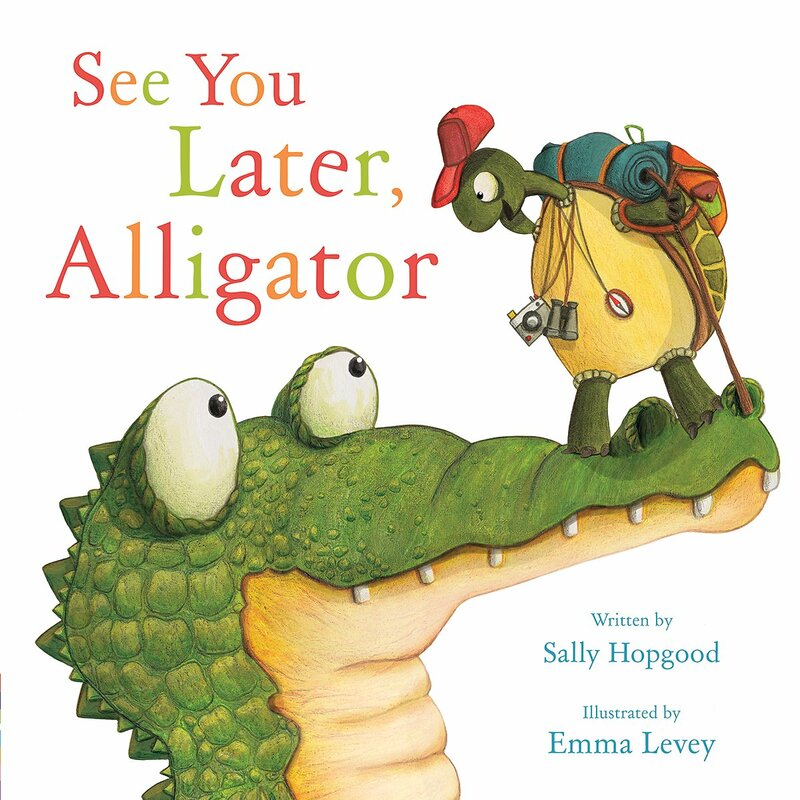 First he encounters his friend, the alligator, so he says – See you later, alligator! As Tortoise meanders his way through the park he encounters many friends. He encounters an ant eater, baby deer, raccoon and many more animals. He takes his time saying goodbye to each and everyone of them. I thought it was interesting how each goodbye rhymed. One of my favorite goodbyes was – The keys are under the mat, kitty cat! But when Tortoise finally gets to the end of his goodbyes and reaches the gates,he finds out they are closed! Tortoise has taken so long saying goodbye to all his friends that the park has closed for the day. So he turns around and heads back home. He’ll try again tomorrow. As he is walking back home, we hear alligator and crocodile talking to each other. We find out that this is a daily occurrence for Tortoise! He spends so much time saying goodbye to each friend that he never makes it out of the park. We really enjoyed reading See You Later, Alligator. It’s full of bright, lively pictures that draw the children into the pages. I loved the rhymes throughout the book. Definitely, a book little ones will want to have read to them time and time again. You can pick up a copy of See You Later, Alligator online or at your local bookstore.